I wasn’t using any packing organizers during my first years of traveling. Recently though, I’ve started using packing cubes, which now I regret not trying out earlier. The truth is, they don’t save that much space, but what you get is more organized and easier packing. No folding, rolling, squeezing. Anyway, I decided to put together this list of best packing cubes for carry on luggage and checked suitcases, because I couldn’t find one that I could agree upon. Ready to start packing more efficiently? Here we go. Do they keep their shape when fully packed? For instance, some packing cubes have a spring in their frame, or a specially designed frame that doesn’t become a round ball when fully packed. You want your cubes to stay square-shaped, which means less wasted space when packing your suitcase. Are they washable? Most aren’t. However, some say that their cubes can be washed in a washing machine. If they can, it likely means they ’re more durable as well. How many cubes are included? If you’re traveling for one to three weeks, anywhere from three to six packing cubes is enough, depending on how tight you want to pack and the size of your carry-on. For most, four cubes are just perfect. If buying for family or couple, are they easily separated by color? When using packing cubes, you just pop the cubes out of the luggage and place them in your hotel bedrooms’ closet. When traveling with my girlfriend, it’s much easier to differentiate which cube belongs to who if they’re differently colored. I’d imagine for larger families, it’s even worse! Is a laundry bag included? A laundry bag is an excellent feature to have because you don’t want your dirty clothes to be laying next to your clean ones. Before using packing cubes, I just used a regular plastic bag. Using a laundry bag is definitely a step towards being a smart traveler. How much do they weigh? Weight is an issue when it comes to checked luggage and hand luggage. You don’t want to add weight with massive packing cubes. Although most are really light anyway, I’ve included some ultra lightweight options down below. Okay, so if you’re new to packing efficiently, packing cubes and compression cubes/bags are not the same. When packing regular packing cubes, you’re left with neat little rectangles that fit together nicely. The idea behind compression bags is that you place all of your clothes in the cube, close it and later save some additional space by a special zipper, that squeezes everything together even closer. This rounds the edges, and your compression bag turns oval-like. Personally, I prefer to use packing cubes for packing carry-ons and suitcases, and compression bags for backpacks. The reasoning behind this is that regular cubes aren’t meant to be stuck in a regular backpack, they’re awkward to fit and result in some corners sticking out. On the other hand, compression bags are perfect for backpacks, as there are no sharp corners and you save even more space using them, which is critical for hiking and camping. For the average traveler, the 4-piece set by Shacke Pak is the best overall option. They have a ton of reviews on Amazon with an almost perfect average rating, so you really can’t go wrong with purchasing this set. First of all, the set comes in the perfect amount of bags needed for the average traveler. Four differently sized bags and an additional laundry bag for your dirty clothes should work just perfect for an averagely sized carry-on. Second, It’s rated amazingly excellent by their customers. Not only do they have the most reviews, but they also have one of the highest star ratings. Of course, there are very similar 4-piece options available, but this one is better branded and more stylish. Did you notice the x cross pattern on the front part of each packing cube? It’s made that way for a reason. It helps to retain the square form, not letting the zippered mesh stretch out the bag. This helps a lot with packing, as they’re perfectly squared and easy to pack. Furthermore, the stitching and zippers are of really excellent build quality. The only minus is that you have to hand-wash them. Despite this fact, it’s still the best option for most people. If you don’t want to spend much on your packing cubes, this 4-piece set by Bagail is your best option. Basically, they’re very similar to the last set by Shacke Pak, but they’re priced a bit cheaper. However, don’t let the low price fear you, because these have still received absolutely amazing reviews on Amazon. This set also comes in four pieces, with an additional laundry bag for your dirty clothes, which should be able to accommodate packing the contents of your carry on. Even when it comes to size, both of these sets are identical. Both of them are offered in identically sized four packing cubes and a laundry bag. So what’s different about this packing cube set? Why is it priced lower than Shacke Pak? That’s because this one isn’t as stylish and branded as the previous one. Something about this set makes it look like it has no character and serves solely for practicality purposes. But isn’t practicality the only thing that matters? Also, it’s worth noting that the reviews on them are almost Identical, with the Shacke Pak being more popular but as good. Overall, this set is the best affordable option for the average traveler, with it being almost identical to the Shacke Pak set, but slightly cheaper. If you have the money, the Ebags Titanium packing cubes 6-piece set is what you should be looking at. Although it costs twice the price of the previous options, in my opinion, you get a better deal. Ebags is a well-known luggage retailer, with hundreds of various products and a reputation for making durable travel accessories. Although a laundry bag isn’t included, you’ll get two additional cubes, increasing the total count of packing cubes to six. If you have a larger suitcase, you should be able to pack almost everything in these cubes, with every inch packed efficiently. Overall, these cubes seem to be really well made, with robust and non-stretchy fabric and rigid zippers. Furthermore, if you want to buy only quality stuff, this set comes backed up with a lifetime warranty, which is pretty unusual for a forty-something dollars packing cube set. If you’re worried about how much these cubes weigh, to give you a perspective, the zippers are the heaviest elements of these packing cubes. The Pro Packing Cubes 6-piece set is made from unique “Rip-stop” nylon, which is really durable and lightweight, leaving you with more weight for your return souvenirs. For about thirty dollars, you’ll get a six cube set that weighs less than a pound. Although they’re a bit more expensive than regular packing cubes, you get a terrific deal for what you’re paying. Generally, six packing cubes should be more than enough if you’re packing a carry-on. In a regularly sized carry-on, you can neatly organize two weeks of clothing and still have some space left for other items, like DSLR, Shoes, and gadgets. Additionally, If you’re looking to equip your whole family, this set is available in 11 different colors. This makes it really easy to determine which family member does the cube belong to. The Pro Packing Cubes 10-piece set is perfect for families and couples. They’re available in five different colors, with each set containing at least five cubes in one color and five in a different color, making it easy to differentiate between who they belong to. If you’re concerned about how much they weigh, don’t worry because they’re just below one pound. They’re made from an ultra-light “Rip-stop” nylon material that’s really hard to stretch or rip apart. These cubes are priced pretty reasonable for a 10-piece set. Actually, if you look at what’s the price for each cube, this set is the cheapest in this list, with each cube priced at about four dollars. Although they’re priced pretty high, the Ebags ultralight packing cubes 5-piece set offers the best packing experience by far. Furthermore, they’re made by a reputable brand and come with a lifetime warranty. Everything about these cubes is well-thought and efficient. For instance, they have a patented design with a spring inside the frame, so that these cubes stay in their form. And then there are all the little details, like coil zippers, silicone coating in the inside to make them easier to fill, and polyurethane exterior finish, so they grip better next to each other. 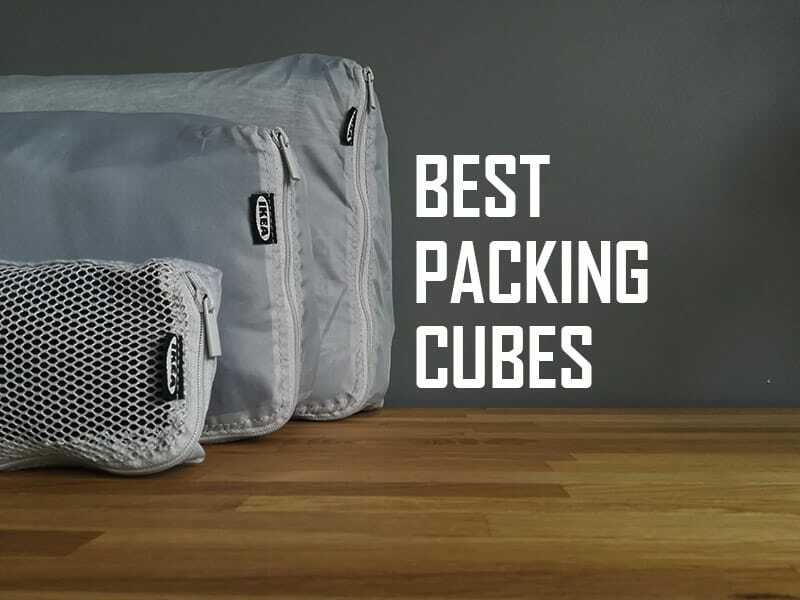 When comparing the weigh between these cubes and regular packing cubes, these feel lighter. Also, five cubes should be enough to fill the contents of your carry-on. 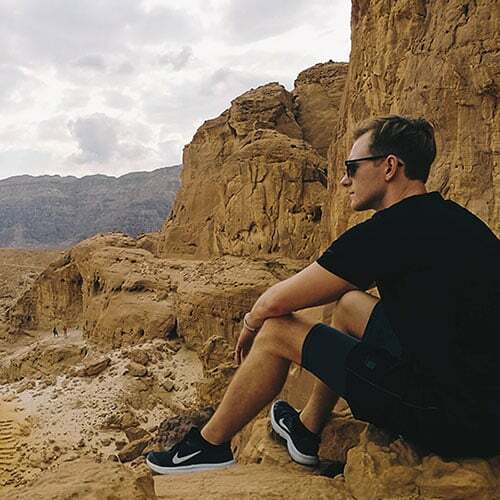 If you have the budget and you take traveling seriously, I’d suggest choosing these over cheaper alternatives. Overall the packing experience is just so much better than their alternatives. Want to maximize the efficiency of your packing? That’s were compression bags come in. The main idea is that you can pack everything in your cube and then squeeze it even tighter with a special zipper that reduces the total volume by half. Eagle Creek is a well-known brand that makes durable travel products, although their prices are on the higher side. If you’re looking at compression bags, you really can’t go wrong with purchasing Eagle Creek Pack-it 2-piece set. These compression cubes are made from a special “Rip-stop” material that will last through even the toughest packing jobs. Furthermore, they seem to be really light as well, which is great for saving some weight on luggage restrictions. Although this set only comes in two pieces, the bags are pretty large and easy to pack your clothes for a week. Also, it’s worth noting that these compression bags are water-resistant, which is perfect if you’re using them in your backpack for camping. Personally, for carry-ons and suitcases, I prefer using packing cubes because the square shape makes them easier to neatly pack together. Generally, compression bags are better suited for backpacks. In a nutshell, the Tripped compression cube 2-piece set is a cheaper alternative for compression cubes by Eagle Creek. They’re offered in almost identical dimensions as their more expensive alternatives, however, they’re available roughly at half the price. The only noticeable difference is that they’re not waterproof. Yes, they’re rain-proof, which means that your contents won’t get wet instantly, but doesn’t protect against more prolonged periods of rain. Other than that, customers rate their quality very close to compression cubes by Eagle Creek. If you’re tight on your budget, or you don’t want to pay extra for a well-known brand, this set can be an excellent alternative. The AmazonBasics 4-piece set is yet another affordable option for the occasional traveler. If you’re looking for a something cheap, both AmazonBasics and Bagail are really good. It’s just a matter of preference. Personally, I’ve used other AmazonBasics products before, and they continue to amaze me with their build quality for such low prices. What you’ll get is four differently sized packing cubes, which should be perfect for fitting all of your clothes for a one or two-week trip. They’re available in six different colors and are one of the cheapest options out there. If you feel safe purchasing only from a well-known brand, this 3-piece packing cube set by Eagle Creek is what you should be looking at. Eagle Creek built their reputation by making only quality travel gear, with this set not being any different. Although it’s not the cheapest option out there, this set is excellent for the occasional traveler who likes to travel organized. This set comes in three pieces, with two packing cubes and a garment folder. You don’t usually see a garment folder included in packing cube sets. It’s meant for items that you wish to fold, rather than roll or squeeze tightly, resulting in fewer wrinkles. If you’re not an expert on folding clothes, this folder is equipped with a folding board, which helps you pack your shirts and pants in this folder. It’s an excellent option for anyone who wants to get their feet wet and start packing more efficiently.